Explain the characteristics of stainless steel and why it is one of the most sustainable materials specified today. Identify the in-use functional benefits of stainless steel sinks such as corrosion resistance, hygiene, non-toxic cleanability and recyclability. Summarize the ADA guidelines as they relate to sinks and know how to specify for ADA compliance. The sink has long been an indispensable feature of kitchens around the world. In earlier times they were constructed from vitreous china, enameled cast iron and local materials such as Italian travertine, Vermont soapstone, or glazed red clay from the English Midlands. Today, such choices still exist and, with the addition of polymers and epoxy resins, a multitude of sink materials are on the market. But there is one sink material that offers significant advantages over the others—stainless steel. Stainless steel sinks are not only produced from one of the most environmentally friendly metals commonly used in construction, they provide many benefits such as corrosion resistance, fire and heat resistance, hygiene, strength to weight advantage, ease of fabrication, impact resistance, antibacterial value, and long-term value. Unlike solid surface materials, stainless steel does not chip, stain, scratch or hold odors. It does not break down when exposed to thermal extremes and is not vulnerable to the porosity issues common to solid surfaces. 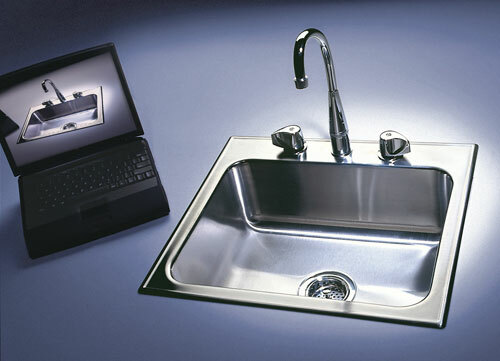 Stainless surfaces are inherently antimicrobial compared to solid surface materials. The hard metallic surface of stainless steel makes it difficult for bacteria to adhere and survive. When properly cleaned and maintained, stainless steel surfaces resist growth of bacteria, mold and microorganisms that can cause disease. 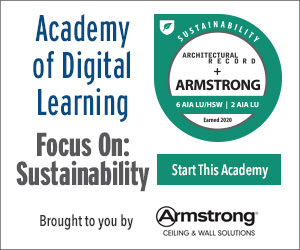 They have documented sustainability features, can meet ADA requirements and have applications for virtually all building types. Moreover, with informed specification they offer a choice of design aesthetics and enhanced functioning. It is not surprising that stainless steel in the manufacture of sinks is one of the largest use applications of stainless steel. From the documented hygienic and corrosion-resistant features, to the virtually unparalleled sustainability, stainless steel offers numerous advantages for design professionals. Stainless steel's resistance to corrosion and staining, low maintenance, low cost relative to other materials and familiar luster make it an ideal material for a host of commercial applications. 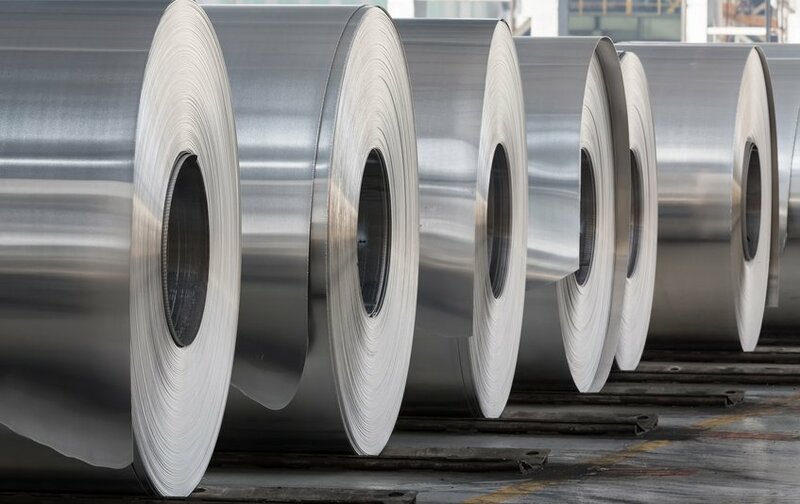 Used for many industrial, architectural, chemical and consumer applications for over half a century, stainless steel is essentially a low-carbon steel, which contains chromium at 10.5 percent or more by weight. It is this addition of chromium that gives the steel its unique stainless, corrosion-resisting and enhanced mechanical properties. The chromium content of the steel allows the formation of an adherent, invisible, corrosion-resisting chromium oxide film on the steel surface. If damaged mechanically or chemically, this film is self-healing, providing that oxygen, even in very small amounts, is present. The corrosion resistance and other useful properties of the steel are enhanced by increased chromium content and the addition of other elements such as molybdenum, nickel, and nitrogen. The addition of nickel changes and stabilizes the crystal structure of the steel at room temperature and below, making it more formable, weldable and tough. Nickel also gives stainless steel a lustrous and brighter appearance which is less gray than steel that has no nickel. There are well over 100 stainless steel alloys and more than 60 grades of stainless steel. The latter can be divided into five classes. Each is identified by the alloying elements which affect their microstructure and for which each is named. The class from which most stainless steel sinks are manufactured is austenitic. The other classes are: ferritic, precipitation-hardening, martensitic, and duplex. Ferritic stainless steel contains approximately 12 percent chromium and virtually no nickel. Since nickel is an expensive alloy, sinks made from ferritic steel are less costly, more brittle at lower temperatures and more gray in color. Austenitic stainless steels, like all other stainless steels containing chromium and nickel, are identified by the American Iron and Steel Institute (AISI) as 300 Series types. The stainless steels in this group have different compositions and properties, but many common characteristics. They can be hardened by cold working, but not by heat treatment. In the annealed (freed from internal stress by heating and gradual cooling) condition all are essentially nonmagnetic. They have excellent corrosion resistance, unusually good formability, and increased strength as a result of cold work. Type 304 is the basic chromium-nickel austenitic stainless steel and has been found suitable for the widest range of applications in all kinds of products and architectural work. 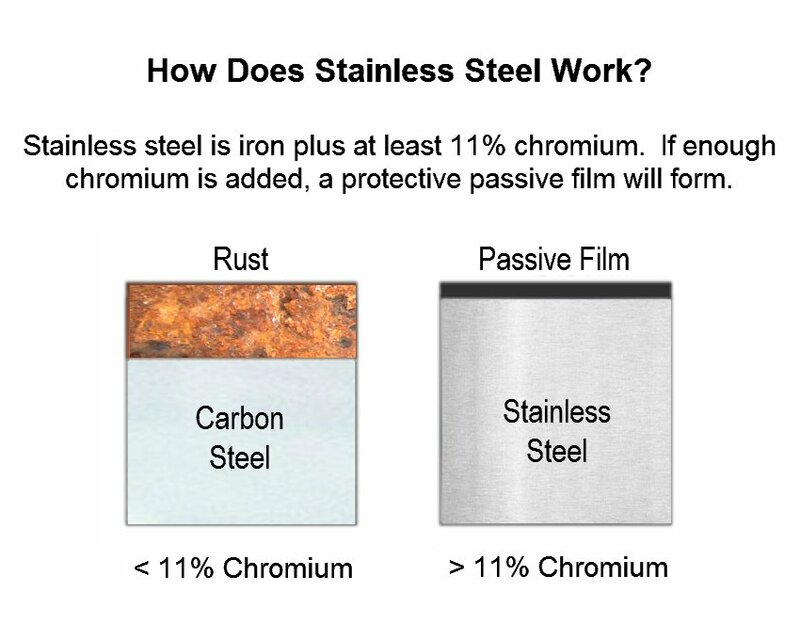 As part of the 300 Series designation it is composed basically of 8 percent chromium and 8 percent nickel and is sometimes referred to as 18-8 stainless. It is nonmagnetic and cannot be hardened by heat treatment. It is readily available in a variety of forms. This type is easy to form and fabricate with excellent resistance to corrosion. Type 316 is the next most commonly used stainless steel for general corrosion resistance. It consists of 16 percent chromium and 10 percent nickel, but offers more corrosion resistance through the addition of 2-3 percent molybdenum. All stainless steels have a resistance to corrosion. Some grades resist better than others. Corrosion resistance is the primary reason for specifying stainless steel. The Specialty Steel Industry of North America (SSINA), a voluntary trade association representing virtually all the producers of specialty steel in North America (www.ssina.com), estimates that one-third of the cost of corrosion of metals in the U.S. (some $100 billion) can be avoided by the use of best known technology that begins with the selection of noncorrosive materials such as stainless steel. It is essential, however, for the design professional to know the nature of the environment and the degree of corrosion or heat resistance required since many variables characterize a corrosive environment—chemicals and their concentration, atmospheric conditions, temperature and time. Severe corrosion may cause pitting that occurs when the protective film breaks down in small isolated spots. Once started, the attack may accelerate because of differences in electric potential between the large areas of passive surface versus the active pit. Generally speaking, lower-alloyed grades of stainless steel resist corrosion in atmospheric and pure water environments, while higher-alloyed grades can resist corrosion in most acids, alkaline solutions, and chlorine-bearing environments. Type 304 stainless steel is used extensively in health-care environments and in food processing environments (except possibly for high-temperature conditions involving high acid and chloride contents). It resists organic chemicals, dyestuffs, and a wide variety of inorganic chemicals. Type 304 L (low carbon) stainless steel resists nitric acid well and sulfuric acids at moderate temperature and concentrations. Type 316 stainless steel with its increased nickel content and addition of molybdenum is desirable where severe corrosion conditions exist and pitting is to be avoided such as in chloride environments. Type 304 stainless steel is standard for leading sink manufacturers. Type 316 is available on request for most models. Corrosion resistance data and standard corrosion references are available from the SSINA’s Design Guidelines for the Selection and Use of Stainless Steel. The Guidelines also contain a useful table listing where different grades of stainless steel are used for particular environments such as soaps and pharmaceuticals. As an aid to design professionals, leading sink manufacturers also offer stainless steel laboratory corrosion data for resistance of stainless steels to chemical media at certain temperatures. 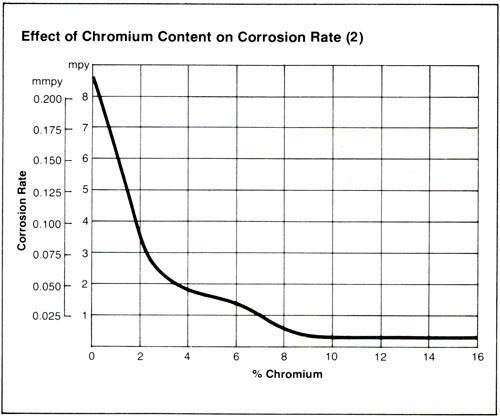 Rates of corrosion are expressed in terms of depth of pitting per year. Stainless steel sink manufacturers point out that the suitability of stainless steels in various corrosive environments is based on a long history of successful applications. However, since small differences in chemical content and temperature can affect corrosion rates, they suggest service tests under the worst operating conditions anticipated in order to determine which optimum materials to specify and suggest ASTM G4 - 01(2008) Standard Guide for Conducting Corrosion Tests in Field Applications as a recommended practice. The many unique values provided by stainless steel make it a powerful candidate in materials selection. Stainless steels are used at temperatures up to about 2000 degrees F (the melting point range for Type 304 is 2550 to 2650 degrees F.) While it is highly unlikely that any sink would be subjected to such high temperatures, design professionals should be aware of the mechanical characteristics of stainless steel when exposed to increased temperatures, and be familiar with suggested maximum service temperatures of stainless steel types. Since stainless steels have been used for elevated temperature service, there is ample fundamental and practical data concerning their resistance to corrosion. When they are exposed at elevated temperatures, changes occur in the nature of the surface film. At mildly elevated temperatures in an oxidizing gas, a protective oxide film is formed—as mentioned earlier. In more aggressive environments with temperatures above 1600 degrees F., the surface film may break down with sudden increase in scaling (visible oxide layers that reduce corrosion resistance). Depending on alloy content and environment, the film may be self-healing for a period of time then followed by another breakdown. According to the SSINA, the suggested maximum service temperatures in air for AISI Type 304 and Type 316 is 1600 degrees F for intermittent service and 925 degrees F. for continuous service.